Can Blueberries Help Prevent Alzheimer's? Can blueberries have a real beneficial effect in improving memory and cognitive function in older adults? 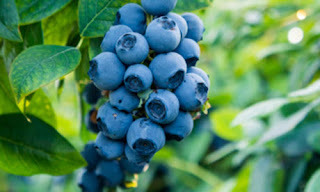 This research caught my attention because I eat blueberries several times each week. I started doing this while I caring for my mother. Could blueberries, a super fruit known for its power to potentially lower the risk of heart disease and cancer, be another weapon in the war against Alzheimer's disease? New research further bolsters this idea, which is being tested by many teams. The fruit is loaded with healthful antioxidants, and these substances could help prevent the devastating effects of this increasingly common form of dementia. In an effort to find ways to slow down the alarming trends in Alzheimer's disease, Krikorian and colleagues at University of Cincinnati Academic Health Center conducted two human studies to follow up on earlier clinical trials. "There was improvement in cognitive performance and brain function in those who had the blueberry powder compared with those who took the placebo. The blueberry group demonstrated improved memory and improved access to words and concepts." "The results were not as robust as with the first study," Krikorian explained. "Cognition was somewhat better for those with powder or fish oil separately, but there was little improvement with memory." Neurocognitive decline with aging and in conditions such as Alzheimer's disease represents a substantial public health concern that will produce suffering in patients and caregivers and enormous expenditures of health care resources. Effective medical treatment for dementia is not available. However, attention has begun to shift to preventive measures, and nutritional intervention represents a potentially potent approach to mitigate risk for late life dementia. We will review the findings of recent human trials examining the effects of blueberry supplementation on cognitive performance and brain function in older adults. These sorts of moderate-term intervention trials have methodological limitations, in particular associated with dose and duration of supplementation and uncertainty about metabolic processes and mechanisms. However, recent findings suggest that supplementation with flavonoid-rich blueberry offers the possibility of significant risk reduction, when practiced in advance of dementia. The researchers presented their work today at the 251st National Meeting & Exposition of the American Chemical Society (ACS). Krikorian acknowledged funding from the U.S. Highbush Blueberry Council, the National Institute on Aging and Wild Blueberries of North America.